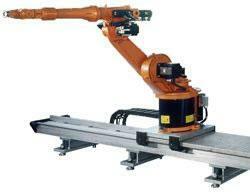 04/09/13, 07:21 AM | Industrial Robotics | Baumer LTD. Robot manufacturer Universal Robots has introduced force control as an integrated part of its software. The technology, which is usually an optional extra feature with other manufacturers, has opened doors to a new world of robot applications. The EVO system is the most integrated solution for high-end aerial cinematography. In December 2012, Analytic Systems was pleased to announce its largest order ever for a power system for AAI Unmanned Aircraft Systems Shadow® Tactical Unmanned Aircraft Systems which are in service with customers including the U.S. Army and Marine Corps. ESAB Welding & Cutting Products introduces the new Swift Arc series of pre-engineered, robotic welding cells available in 3 models: Swift Arc AL (angle-load), Swift Arc FL (front-load), and Swift Arc SL (side-load) robot cells. "OPAL 2.0 and 3DRi represent the first step in Neptec's broader strategy to adapt over 20 years of technology innovation for clients such as NASA and the Canadian Space Agency for commercial use on Earth"